Summary: The so-called “Nazca astronaut” figure is best explained as a depiction of a fisherman, refuting yet another ancient astronaut claim. Note: Some images in this post are large and may be slow to load. 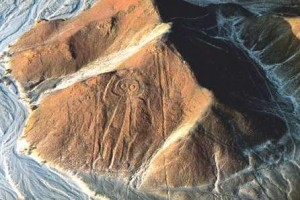 Last week Frank Johnson over at the Ancient Aliens Debunked blog provided an intriguing explanation for the alleged “astronaut” figure etched into the hill near the Nazca plain. Ancient astronaut writers have long claimed that this geoglyph was a depiction of a goggle-eyed extraterrestrial visitor waving to passersby. Johnson discusses the work of two Czech engineers who investigated the site, and I’d like to amplify his comments with additional material. 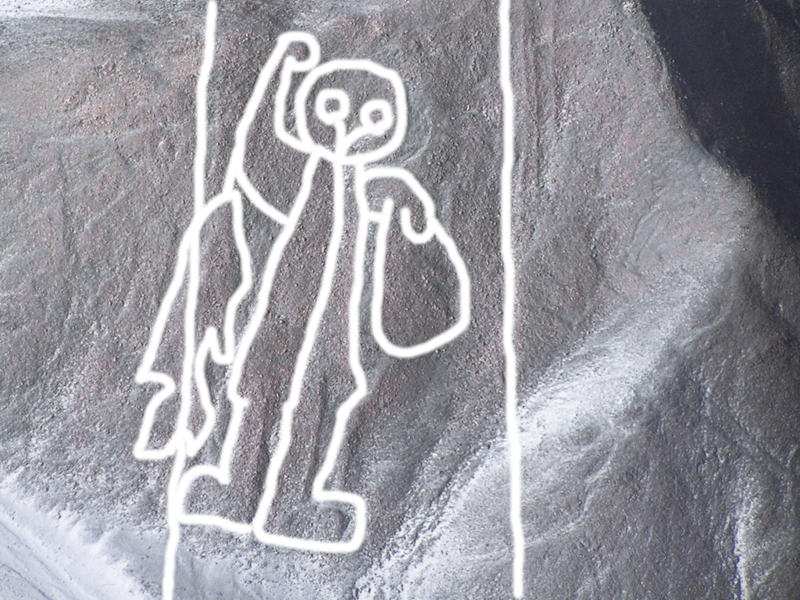 The “Nazca Astronaut,” known to archaeologists as the “owl-man,” is an etched geoglyph in human form, approximately 100 feet (30 meters) high, situated between two etched parallel lines on a hill near the Nazca plateau such that it could be seen from the coast. 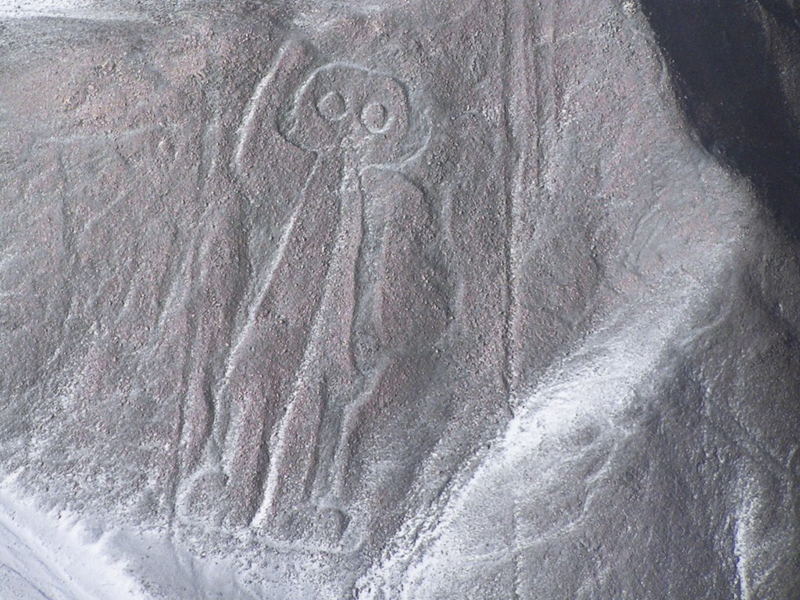 The longtime scholar of the Nazca drawings, Maria Reiche, named the figure the “owl-man” when she published the first aerial photograph of it in her 1949 book, The Mystery of the Desert, which suggested an astronomical purpose for this and other Nazca etchings. It became known as the “astronaut” only after ancient astronaut writers popularized the image. The Owl-Man as seen on the Ancient Aliens Debunked Blog. Sarah Moran’s discussion of the so-called Nazca astronaut in her 1998 book Alien Art: Extraterrestrial Expressions on Earth, written in cooperation with Erich von Däniken, is typical of the way ancient astronaut believers view the image. Erich von Däniken has suggested that [this figure represents] the beings who landed their craft thousands of years ago on the plains. He maintains that the whole area … has been carefully designed as a marker to guide the extraterrestrials back to Earth safely. Unfortunately, little material has been published about the “astronaut” except for what ancient astronaut writers have written. Mainstream sources are content merely to refer to it as a “peculiar anthropomorphic figure” (National Geographic Concise History of the World) or attribute it to religious impulses, perhaps depicting the “Oculate Being” (Recent Studies in Pre-Columbian Archaeology, vol. 2). This has given ancient astronaut writers a blank check to write whatever they wish about this figure and its supposed resemblance to “Grey” aliens. The alleged astronaut raises his right hand, which holds a net ... a fishing net, Czech scientists say. At the foot of the figure is seen a fish, or perhaps two, one above the other. The alleged astronaut is a fisherman, say the engineers Frantisek Klokocník and Jaroslav Vitek. And indeed, archaeological investigations have revealed an intense exchange of goods between the coast and the mountains, and fish was one of the most important items of exchange. The Czech experts point out that some of the local archaeologists have accepted this hypothesis. Everything about it fits perfectly: the figure of the fisherman served for orientation; the fish symbolizes prosperity. Near the spot where the fisherman is inscribed, two parallel lines that probably guided travelers from the coast can be seen on the ground. Engineers Jaroslav Vítek and Frantisek Klokocník also formulated the hypothesis that the figure of the fisherman was a kind of billboard. The Czech scientists conducted an experiment in which they had locals try to recreate a geoglyph. They estimated that a small geoglyph could be etched in a few days, while the “Astronaut” might have taken a full year to produce. Johnson provided only a small “artist’s impression” of how the geoglyph would have looked, which makes it difficult to visualize exactly what we’re looking at. Below, I have taken a photograph of the geoglyph and have outlined in white the two parallel lines, the fisherman, his net, and the fish. I have used a photograph from “Paradise in the World,” a travel website that favorably presents the ancient astronaut hypothesis. The original photograph of the so-called "Astronaut." The fisherman, his fish, his net, and the parallel guidelines outlined in white. When outlined, it is very easy to see how the figure depicts a fisherman in a fishing outfit, holding a net in his left hand and raising a fish on a line with his right hand.